Have you ever seen one of those covers that totally grabs your attention? The cover to Amazing Spider-Man #361 immediately comes to mind. That image of Carnage holding Spider-Man in such a way that you knew something bad was going to happen inside the pages of that comic. Another that comes to mind is the Incredible Hulk #340. I can still remember seeing that as a teenager, when I was knee deep in trading comics with my friends, and just marveling at the work Todd McFarlane put into making it epic. That brings me to this week’s Back Issue Bin. Just look at the cover of this. The Punisher, poised and ready to fire a… missile launcher?! Holy $#%# !! Now I’ve gotta see what happens inside! With something like this, it just grabs your attention and pulls you in. Yes, spend that hard earned allowance money and buy it! That’s what I did. Let’s see if all the dishes my wife made me do were worth it, shall we? It all starts simply enough. A man is walking on the wrong side of New York. It’s 1987, and crack and cocaine are filling the streets. As this man walks, he gets held by knife point. “It’s just the money!” the mugger says, and as the man hands over his wallet, the knife goes in his belly. It seems like that takes place a lot in New York these days, but wait, is he wearing Kevlar? Could that be… The Punisher? It is. With quick change, he follows the would be killer to a crack house not too far away. Frank Castle has been planning for this. Opening a locked dumpster he set there days before, he pulls out what we see on the cover of this wonderful comic: a rocket launcher. Things are about to get very loud. That there is just the beginning. This issue is really a story about an old Vietnam buddy of Franks: Bruce Ayres. Mike Baron’s script takes us not only through the awesome opening sequence, but into the world of Frank Castle. Castle’s origin is petty much established by the mini-series that came out before this issue, so there’s no real need to go over that again. Baron knows this, and pushes forward into the Punisher’s world and his own personal war against, well, everything. This is helping to establish the status quo for the character, and Mike Baron’s story, in just these few pages, really fleshes out the character that is the Punisher. It’s brutal, more brutal than I was expecting, but it certainly fits. Baron’s script brings it all together, and doesn’t just focus on the gritty. If it was all just blood and guts, that’d be OK, but there is an underlying story here, and it flows pretty nicely. Based on the cover alone, Klaus Janson’s art had me sold. I mean, look at it. That rocket launcher just begging to be fired into the face of some hapless schmuck with a tiny pistol. Oh, the anxiety! The interior art is great too. At first, I was reminded of Sal Buscema’s art for Spectacular Spider-Man. It certainly has that feel. Sharp edges and sketch lines throughout, but Janson makes it his own. It’s scattered and edgy, rigid and raw. A Punisher series needs art like this, and Klaus brings it to the table. As the action takes place Klaus’ pencils hold you until that last bullet has flown, and that last thug hits the floor. It’s definitely a sight to see. I enjoyed this very much. I had read later issues in the series during the 90’s, but after reading this, I wish I had gotten this in earlier issues. 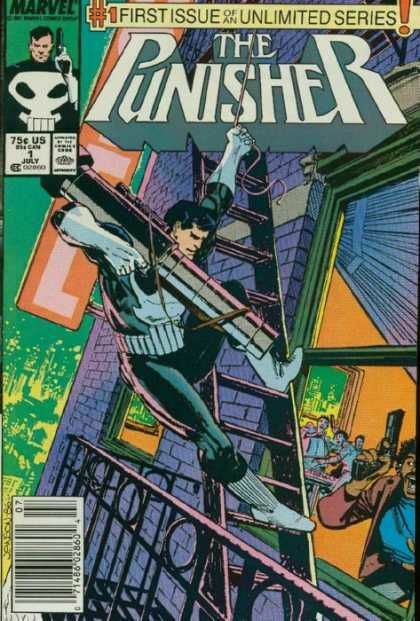 I can always remember reading Punisher and knowing that it was missing something. After reading this, I can see what that was. Here, it was fresh. It was something new. I think that this really pushed the Comic’s Code to it’s limit, or at least as far as Marvel was willing to go. As goons die, blood is black, and no bullet holes can be seen in bodies. You sure know what’s going on, but it’s cleverly drawn and scripted in such a way as to not invoke the terror that was the Comic’s Code. If the Punisher had stayed like this in later issues, I think the series would have gone longer than the 100+ that it did. Not to say that wasn’t a good run. It was, but at times, Punisher just stopped punishing and started scolding. That’s for another article, but I think you get what I’m saying. If you haven’t read this, I recommend that you pick it up. I found issue 2 in a dollar bin at a convention the other day, so later issues won’t be difficult to get. This is the start of what a Punisher story should be. Lots of punishing with Uzi’s, 9mm hand guns and, of course, rocket launchers. What would you do if you were staring back at that missile with your name on it? Well, I guess the first question I’d have to ask you is, what are you doing in that crack house anyway?! Parental concern: Quite a bit of violence, but with the Comic’s Code keeping that ever watchful eye, it doesn’t look vicious. I love these reviews of classic #1s. I bought this months ago specificlly for BIB. It got lost in the shuffle and I pulled it out of the box last week. The cover alone is what sold me on wanting to read it. Man, was it good! I bought this issue over a year ago at a LCS. Couldn’t resist…lovely cover and decently priced…not at the steal you got it for though! I really liked it. I think it was the first completely satisfactory issue of Punisher that I’ve read. Great issue to feature, and good review! I’m with you on your last question, LOL!